Circle Secretaries / Divisional and Branch Secretaries. of NFPE, FNPO & GDS Unions. The Government of India , Ministry of Finance has again rejected the demand of PJCA for inclusion of matters relating to GDS Wages revision and other service conditions in 7thCPC . 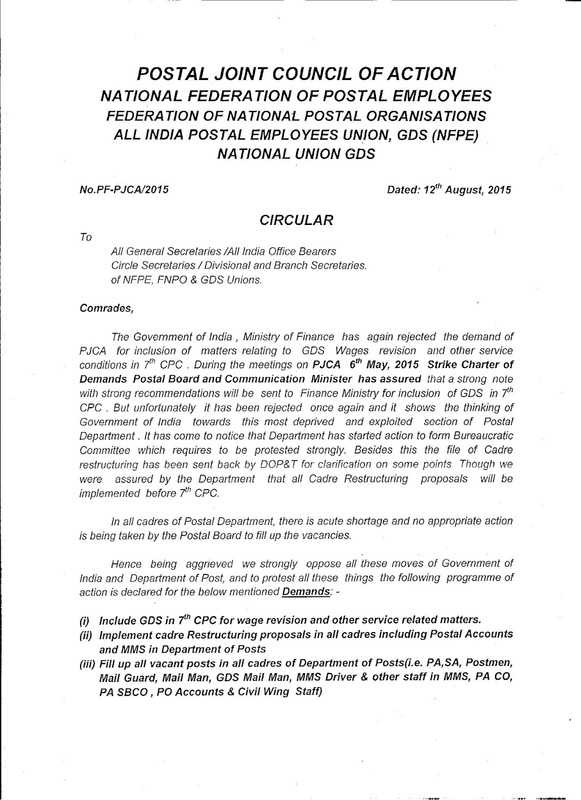 During the meetings on PJCA 6th May, 2015 Strike Charter of Demands Postal Board and Communication Minister has assured that a strong note with strong recommendations will be sent to Finance Ministry for inclusion of GDS in 7th CPC . But unfortunately it has been rejected once again and it shows the thinking of Government of India towards this most deprived and exploited section of Postal Department . It has come to notice that Department has started action to form Bureaucratic Committee which requires to be protested strongly. Besides this the file of Cadre restructuring has been sent back by DOP&T for clarification on some points. Though we were assured by the Department that all Cadre Restructuring proposals will be implemented before 7th CPC. In all cadres of Postal Department, there is acute shortage and no appropriate action is being taken by the Postal Board to fill up the vacancies. 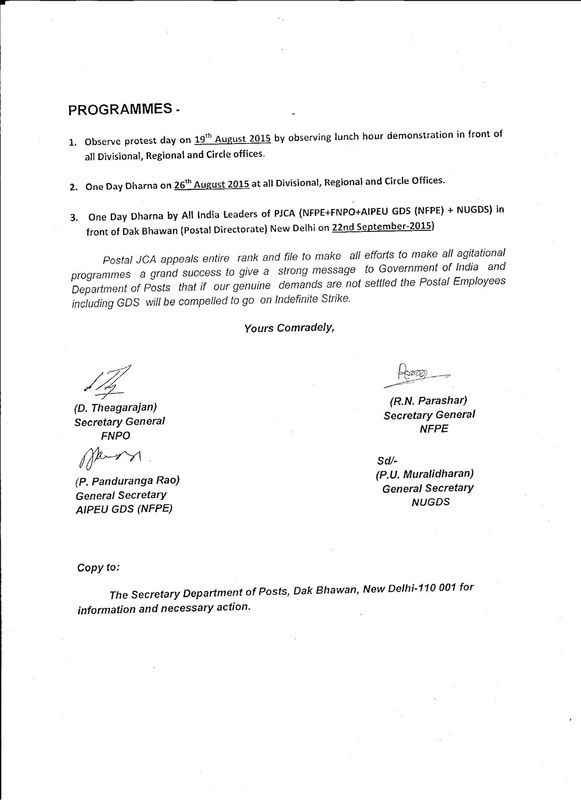 (i) Include GDS in 7th CPC for wage revision and other service related matters. 1. Observe protest day on 19th August 2015 by observing lunch hour demonstration in front of all Divisional, Regional and Circle offices. 2. One Day Dharna on 26th August 2015 at all Divisional, Regional and Circle Offices. 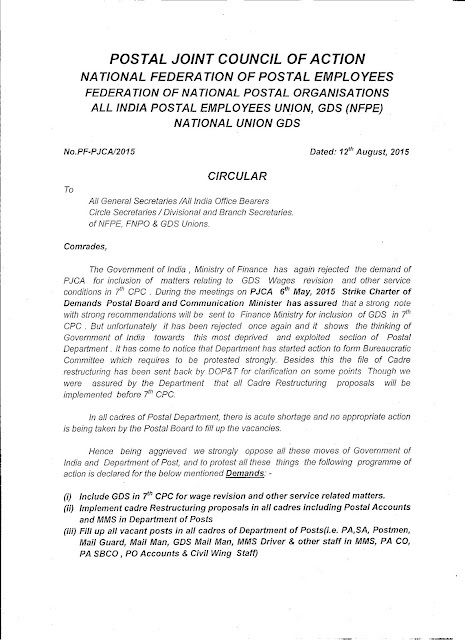 Postal JCA appeals entire rank and file to make all efforts to make all agitational programmes a grand success to give a strong message to Government of India and Department of Posts that if our genuine demands are not settled the Postal Employees including GDS will be compelled to go on Indefinite Strike. The Secretary Department of Posts, Dak Bhawan, New Delhi-110 001 for information and necessary action.